Everytime we take a trip we come up with more carschooling ideas. Carschooling is a method of learning where you use the experiences around you as you travel and your time in the car itself to learn. We have found that most of our car schooling experiences have been just as enriching and educational as our “formal classroom” experiences. We have listed some of our carschooling ideas below. Please share in the comments what carschooling ideas your family uses! Our recent list started with an eleven hour car trip! Eleven hours of a car trip, even spread out over two days is long so we ran out of things to do and decided we needed to create a new car-schooling curriculum. The old games of finding the alphabet on the street signs were not amusing us anymore so we decided to make our own carschooling “curriculum”. I have to admit that creating the curriculum was actually the most entertaining part of the “game”. We only actually finished a few courses during this trip but it was very fun to create the curriculum with the kids and hear their ideas. This list purposely includes our funny ideas to inspire you to create your own. The one thing we’ve learned about carschooling over the years is that the more silly it is – the more fun it is! 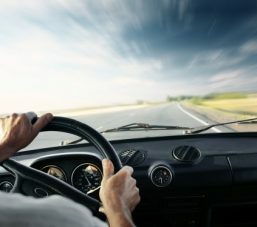 My son and I still talk about the time we laughed ourselves silly by calculating (math) how much time in minutes (that often calculated into days) other drivers wasted of our lives by causing delays in traffic at traffic lights, not using their turn signals, or having other annoying habits. Biology: Figure out which splotches on the windshield are bugs and which are bird droppings. Advanced Biology: Figure out which exact bugs the splotches are. Primary Math: Count exactly how many cows there are along Hwy. 80 in Nebraska (we got up to 538 visible and then stopped). Math: The first person to add up all the numbers on the “How far is it until…” sign gets to name the town the new mileage leads to. Advanced Math: Figure out the ratio of live animals to dead (road kill) animals we see from the highway. History: Stopping at the Pony Express station because every time we go to Boulder we pass the sign for it and we finally could not stand it anymore. We had to know what it looked like! Language: See how many of the road signs you can pronounce or spell after you pass. Ogalala, Nebraska was the most fun. Spanish: Decipher the store signs at the Mexican clothing shops on the way into Boulder, CO (Mosi actually learned 4 words). Art Class: Breathe on the windows and then draw things in the steam. Gym Class: Race to see who will be the first one to get to the bathroom at the rest stop. We finally arrived in Boulder about this time…does anyone else have any more ideas? I know a lot of you have taken/will take road trips this summer! One of my favorite things about Earthschooling is that it is a way of life rather than a place you go to learn. When you are so deeply involved in your child’s education and education in general the learning and integration of learning and life never follow a time-schedule or the ring of a bell. For me, this trip has been a fantastic example of that. We ventured out on this two-week tour without any lesson plan. I didn’t even map out any specific tourist destinations that we “should see” for educational reasons (always a wonderful temptation). We just followed my lecture/seminar/consulting schedule and along the way we made up the trip as we went along. What amazes me most of all is that the past ten days have been the best geography lesson we have ever experienced. It has gone beyond any lesson I ever planned and any book, lesson or story they have ever read. We have travelled through farmland, prairie, ranges, mountains, low-altitude locations, high-altitude locations, blasted rocks that show the patterns of desert history, buttes, springs, sandy desert, rocky deserts, dry deserts, deserts after a rain-fall, mountain ranges, mountains with evergreens, mountains covered with rocks, mountains covered with burned brush, mountains with snow at the top, river-beds, lakes, plateaus, and much more. The kids followed along with the road map as we drove from Colorado through New Mexico to reach El Paso, Texas, and noticed that El Paso is right on the border of Texas and Mexico. We learned how vast Texas is by driving from El Paso to Austin and we learned about it’s unusual shape by driving from El Paso to the upper tip of west Texas. We were able to experience the borders of the states instead of drawing them on paper or tracing the shape of each state in a notebook. They became real and alive and part of a map that will always be imprinted in our heads. we saw more open space in New Mexico and Texas than we have ever seen in our entire lives. We also saw vast skies with many various weather patterns strung across them like a dreamscape. At one point, as we were driving into El Paso we saw half of the sky dark with thunder and lightening and deep grey clouds. The other half of the sky (on the left side of the road and behind us) was bright blue with white fluffy clouds.